The North Carolina Network Consortium (NCNC) is a diverse statewide consortium of providers, academic institutions, and patients whose mission is to address pressing questions related to the delivery of primary care health services and the management of primary care problems. Five practice-based research networks have combined resources in forming the NCNC; they represent over 2100 providers in over 350 practices across the state, including all three primary care specialties (family medicine, internal medicine, and pediatrics) and strong representation of minority populations. 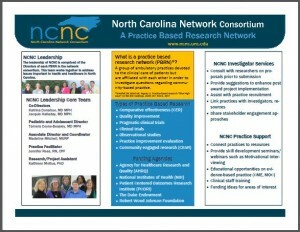 The participating PBRNs include NCnet formed from the PBRNs founded at UNC, the Duke Primary Care Research Consortium (PCRC), the Eastern Carolina Association for Research and Education (E-CARE), the Mecklenburg Area Partnership for Primary Care Research (MAPPR), and the Mountain Area Health Education Center (MAHEC). The participating academic institutions are the University of North Carolina at Chapel Hill (UNC-CH), Duke University, East Carolina School of Medicine, MAHEC and Atrium Health. NCNC is co-directed by Katrina Donahue, MD, MPH and Jacquie Halladay, MD, MPH, of UNC’s Department of Family Medicine and the Sheps Center for Health Services Research. Erica Richman, PhD MSW is the network coordinator. NCNC’s component PBRNs have conducted a large body of relevant research. Articles containing research conducted in NCNC PBRNs have been published in Lancet, the New England Journal of Medicine, JAMA, Annals of Family Medicine, Pediatrics, Arthritis and Rheumatism, Family Medicine, the Journal of Alternative and Complementary Medicine, and others. The NCNC director, co-director, and the directors of its participating PBRNs are highly trained, experienced scientists familiar with primary care and with research methods, and with strong publication track records. The NCNC is one of ten primary care research networks nationally to have held a master task order contract from the US Agency for HealthCare Research and Quality (AHRQ); in 2007-08 it received four contracts from AHRQ to conduct community-based research. NCNC is partially supported by NC TraCS Institute and the Community and Stakeholder Engagement (CaSE) service at NC TraCS.